Chandragupta Maurya ( ), sometimes known simply as Chandragupta (born c. 340 BCE, ruled c. 320 – 298 BCE, died about 298 BCE), was the founder of the Maurya Empire. Chandragupta succeeded in bringing together most of the Indian subcontinent. As a result, Chandragupta is considered the first unifier of India and its first genuine emperor. 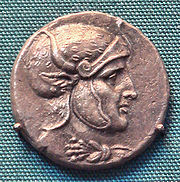 In foreign Greek and Latin accounts, Chandragupta is known as Sandrokyptos (Σανδρόκυπτος), Sandrokottos (Σανδρόκοττος) or Androcottus. Prior to Chandragupta's consolidation of power, small regional kingdoms dominated the northwestern sub-continent, while the Nanda Dynasty dominated the Indo-Gangetic Plain. After Chandragupta's conquests, the Maurya Empire extended from Bengal and Assam in the east, to Afghanistan and Balochistan in the west, to Kashmir and Nepal in the north, and to the Deccan Plateau in the south. His achievements, which ranged from conquering Alexander the Great's Macedonian satrapies and conquering the Nanda Empire by the time he was only about 20 years old, to defeating Seleucus I Nicator and establishing centralized rule throughout South Asia, remain some of the most celebrated in the history of India. Over two thousand years later, the accomplishments of Chandragupta and his successors, including Ashoka the Great, are objects of great study in the annals of South Asian and world history. While many Indian historians hold the view that Chandragupta was an illegitimate child of the Nanda Dynasty of Magadha in eastern India, born to a Nanda prince and a maid named "Mura", later literary traditions imply that Chandragupta may have been raised by peacock-tamers ( ), which earned him the Maurya epithet. Both the Buddhist as well as Jain traditions testify to the supposed connection between the Moriya (Maurya) and Mora or Mayura (Peacock). Yet there are other literary traditions according to which Chandragupta belonged to Moriyas, a Kshatriya clan of a little ancient republic of Pippalivana located between Rummindei in the Nepali Terai and Kasia in the Gorakhpur district of Uttar Pradesh . There are differing theories regarding Chandragupta Maurya’s origins. A common view is that Chandragupta originated from Magadha, possibly as the son of a Nanda prince and a maid named "Mura". A kshatriya people known as the "Mauryas" who had received the relics of the Gautama Buddha are also mentioned in the Mahaparinibbana Sutta of the Digha Nikaya: "Then the Moriyas of Pipphalivana came to know that at Kusinara the Blessed One had died. And they sent a message to the Mallas of Kusinara, saying: "The Blessed One was of the warrior caste, and we are too. We are worthy to receive a portion of the relics of the Blessed One. We will erect a stupa over the relics of the Blessed One and hold a festival in their honor. Others claim that the Mauryas were the Muras or rather Mors, and another view of a Jat origin of Indo-Scythian lineage has been proposed. Another school of thought, including scholars such as B. M. Barua, J. W. McCrindle, D. B. Spooner, H. C. Seth, Hari Ram Gupta, Ranajit Pal, Gur Rattan Pal Singh and Kirpal Singh have connected Chandragupta to Gandhara (or Kamboja) in modern day Pakistan . Based on interpretations of Plutarch and Appian's writings, these scholars assert that Chandragupta Maurya may have belonged to the north-west frontier region, possibly to the Assakenoi or Ashvaka (q.v.) Kshatriya clan of Swat /Kunar valley (modern Koh-I-Mor or Mer-coh — the Meros of the classical writings; probably Meru of Sanskrit texts and Mor and Mer in Prakritic) . It has been claimed by several scholars that Chandragupta belonged to the Ashvaka tribe of this region (known as Mor), and thus, the dynasty founded by him was called Moriya or Maurya. . The Ashvakas were a section of the Kambojas, who were exclusively engaged in horse-culture and were noted for providing mercenary cavalry.H.C. Raychaudhuri noted that the name Priyadarshi was adopted also by Chandragupta as also noted by W. W. Tarn. Very little is known about Chandragupta's youth. Much of what is known about his youth is gathered from later classical Sanskrit literature, as well as classical Greek and Latin sources which refer to Chandragupta by the names "Sandracottos" or "Andracottus". He was paragon for next rulers. According to this tradition, the encounter would have happened around 326 BCE, suggesting a birth date for Chandragupta around 340 BC. Chandragupta Maurya with the help of Chanakya defeated the Magadha kings and the bulk army of Chandravanshi clan and defeated generals of Alexander settled in Gandhara (Kamboja kingdom of Aryan Mahajanpad) which is called as Afghanistan now. At the time of Alexander's invasion, Chanakya was a teacher at Takshasila University. The king of Takshasila and Gandhara, Ambhi (also known as Taxiles), made a treaty with Alexander and did not fight against him. Chanakya saw the foreign invasion against the Indian culture and sought help from other kings to unite and fight Alexander. Porus (Parvateshwar), a king of Punjab, was the only local yadav king who was able to challenge Alexander at the Battle of the Hydaspes River, but was defeated. Chanakya then went to Magadha further east to seek the help of Dhana Nanda, who ruled a vast Nanda Empire which extended from Bihar and Bengal in the east to eastern Punjab in the west, but he denied any such help. After this incident, Chanakya began sowing the seeds of building an empire that could protect Indian territories from foreign invasion into his disciple Chandragupta. Chandragupta later adopted Jainism. It is said he died fasting which was according to Jainism a holy way of sacrificing mortal life. Chandragupta's adviser or prime minister Chanakya, who is also known as Kautilya and was the author of the Arthashastra, is regarded as the architect of Chandragupta's early rise to power. Chandragupta Maurya, with the help of Chanakya, began laying the foundation of the Maurya Empire. In all forms of the Chanakya legend, he is thrown out of the Nanda court by the king, whereupon he swears revenge. While in Magadha, Chanakya by chance met Chandragupta in whom he spotted great military and executive abilities. Chanakya was impressed by the prince's personality and intelligence, and immediately took the young boy under his wing to fulfill his silent vow. Depending upon the interpretation of Justin's accounts, the second version of the above story is that Chandragupta had also accompanied Chanakya to Pataliputra and himself was insulted by Dhana Nanda (Nandrum of Justin). If this version of Justin's accounts is accepted, then the view that Chanakya had purchased Chandragupta from Bihar, on his way back to Taxila, becomes irrelevant. The shrewd Chanakya had trained Chandragupta under his expert guidance and together they planned the conquest of the Nanda Empire. In order to defeat the powerful Nanda army, Chandragupta needed to raise a formidable army of his own. Having consolidated power in the northwest, Chandragupta pushed east towards the Nanda Empire. Chandragupta's empire when he founded it circa 320 BC, by the time he was about 20 years old. Chanakya had trained Chandragupta under his guidance and together they planned the destruction of Dhana Nanda. The Mudrarakshasa of Visakhadutta as well as the Jaina work Parisishtaparvan talk of Chandragupta's alliance with the Himalayan king Parvatka, sometimes identified with Porus. It is noted in the Chandraguptakatha that the protagonist and Chanakya were initially rebuffed by the Nanda forces. Regardless, in the ensuing war, Chandragupta faced off against Bhadrasala – commander of Dhana Nanda's armies. He was eventually able to defeat Bhadrasala and Dhana Nanda in a series of battles, ending with the siege of the capital city Kusumapura and the conquest of the Nanda Empire around 321 BC, thus founding the powerful Maurya Empire in Northern India by the time he was about 20 years old. By the time he was only about 20 years old, Chandragupta, who had succeeded in defeating the Macedonian satrapies in India and conquering the Nanda Empire, had founded a vast empire that extended from the Bay of Bengal in the east, to the Indus River in the west, which he would further expand in later years. The exact details of engagement are not known. As noted by scholars such as R. C. Majumdar and D. D. Kosambi, Seleucus appears to have fared poorly, having ceded large territories west of the Indus to Chandragupta. Due to his defeat, Seleucus surrendered Arachosia, Gedrosia, Paropamisadae, and Aria. Mainstream scholarship asserts that Chandragupta received vast territory west of the Indus, including the Hindu Kush , modern day Afghanistan , and the Balochistan province of Pakistan . Archaeologically, concrete indications of Mauryan rule, such as the inscriptions of the Edicts of Ashoka, are known as far as Kandhahar in southern Afghanistan. It is generally thought that Chandragupta married Seleucus's daughter, or a Greek Macedonian princess, a gift from Seleucus to formalize an alliance. In a return gesture, Chandragupta sent 500 war-elephants, a military asset which would play a decisive role at the Battle of Ipsus in 302 BC. In addition to this treaty, Seleucus dispatched an ambassador, Megasthenes, to Chandragupta, and later Deimakos to his son Bindusara, at the Mauryan court at Pataliputra (modern Patna in Bihar state ). Later Ptolemy II Philadelphus, the ruler of Ptolemaic Egypt and contemporary of Ashoka the Great, is also recorded by Pliny the Elder as having sent an ambassador named Dionysius to the Mauryan court.. The extent of the Maurya Empire after Chandragupta's southern conquests circa 300 BC. Chandragupta gave up his throne towards the end of his life and became an ascetic under the caca saint Bhadrabahu, migrating south with them and ending his days in sallekhana at Shravanabelagola , in present day Karnataka ; though fifth-century inscriptions in the area support the concept of a larger southern migration around that time. A small temple marks the cave (Bhadrabahu Cave) where he is said to have died by fasting. Chandragupta Maurya renounced his throne to his son, Bindusara, who became the new Mauryan Emperor. Bindusara would later become the father of Ashoka the Great, who was one of the most influential kings in history due to his important role in the history of Buddhism. H. Goetz (1955). "Early Indian Sculptures from Nepal", Artibus Asiae 18 (1), p. 61-74. B. M. Barua. Indian Culture, vol. X, p. 34. Journnal of the Royal Asiatic Society of Great Britain and Ireland, 1915, (Pt.II), pp 406, 416-17,D.B. Spooner. "Did Candragupta Maurya belong to North-Western India? ", Annals of the Bhandarkar Oriental Research Institute, Poona, 1936, p 158-165, Bhandarkar Oriental Research Institute. "Was Chandragupta Maurya a Punjabi? "', Punjab History Conference, Second Session, October 28-30, 1966, Punjabi University Patiala, pp. 32-35, H. R. Gupta. Ranajit Pal, Non-Jonesian Indology and Alexander, New Delhi, 2002. "They Taught Lessons to Kings", Gur Rattan Pal Singh; Article in Sunday Tribune, January 10, 1999; See also: My reminiscences, 1999, Gur Rattan Pal Singh. The Kambojas Through the Ages, 2005, p 151, Kirpal Singh. Invasion of Alexander, 2nd Ed, p 112, J. W. McCrindle. "They Taught Lessons to Kings", Gur Rattan Pal Singh; Article in Sunday Tribune, January 10, 1999; Kambojas Through the Ages, 2005, p 149-154, Kirpal Singh. For H. C. Seth's views, "Did Candragupta Maurya belong to North-Western India?"' consult: (1) Annals of the Bhandarkar Oriental Research Institute, Poona, 1936, p 158-165, Bhandarkar Oriental Research Institute;(2) Also see: The Indian Review, 1936, p 814, edited by G.A. Natesan; (3) "Sasigupta and Chandragupta", Indian Historical Quarterly, 1963, p 361. "Did Candragupta Maurya belong to North-Western India? ", Annals of the Bhandarkar Oriental Research Institute, Poona, 1936, p 164, Bhandarkar Oriental Research Institute, H. C. Seth; The Indian Review, 1937, p 814, Ed G.A. Natesan - India. See also: Punjab revisited: an anthology of 70 research documents on the history and culture of undivided Punjab, 1995, Ahmad Saleem - History; Punjab past and present: essays in honor of Dr. Ganda Singh‎, 1976, p 28, Ganda Singh - History. "They Taught Lessons to Kings", Gur Rattan Pal Singh; Article in Sunday Tribune, January 10, 1999. For Ashvakas being sections of the Kambojas, see: Historie du bouddhisme Indien, p. 110, E. Lammotte; East and West, 1950, pp. 28, 149, 158, Istituto italiano per il Medio ed Estremo Oriente, Editor, Giuseppe Tucci, Co-editors Mario Bussagli, Lionello Lanciotti. Other refs on Ashvakas = Kambojas are: Hindu Polity, A contitutional History of India in Hindu Times, 1978, p. 140, K. P. Jayswal; Political History of Ancient India, 1996, p. 133 fn. 6, pp. 216-20, (See also Commentary, op. cit., p. 576, fn. 22), H. C. Raychaudhury, B. N. Mukerjee; Panjab Past and Present, pp 9-10, Buddha Parkash; History of Punjab, Vol I, 1997, p. 225, (Editors) L. M. Joshi, Fauja Singh, Publication Bureau, Punjabi University Patiala; Raja Poros, 1990, Publication Bureau, Punjabi University Patiala; Ancient Kamboja, People and Country, 1981, pp. 271-72, 278, J. L. Kamboj; These Kamboj People, 1979, pp. 119, 192, K. S. Dardi; Kambojas through the Ages, 2005, pp. 129, 218-19, Kirpal Singh; Note: J. W. McCrindle says that the modern Afghanistan – the Kaofu (Kambu) of Hiun Tsang was ancient Kamboja, and name Afghan evidently derives from the Ashavakan, the Assakenoi of Arrian (Alexander's Invasion of India, p 38; Megasthenes and Arrian, p. 180, J. W. McCrindle). Thomas H. Holdich, in his classic book, (The Gates of India, pp. 102-103), writes that the Aspasians (Aspasios) represent the modern Kafirs. But the modern Kafirs, especially the Siah-Posh Kafirs (Kamoz/Camoje, Kamtoz) etc., are considered to be modern representatives of the ancient Kambojas. Other scholars like R. C. Majumdar, Romila Thapar etc., also take Ashvakas to be clans of the Kambojkas. Ramesh Chandra Majumdar (1977). Ancient India. Motilal Banarsidass Publ. ISBN 8120804368. "Kautilya [is] sometimes called a Chancellor or Prime Minister to Chandragupta, something like a Bismarck..."
Radha Kumud Mookerji, Chandragupta Maurya and His Times, 4th ed. (Delhi: Motilal Banarsidass, 1988 ), pp. 31, 28–33. John Marshall Taxila, p. 18, and al. Vincent A. Smith (1998). Asoka. Asian Educational Services. ISBN 8120613031. Walter Eugene Clark (1919). "The Importance of Hellenism from the Point of View of Indic-Philology", Classical Philology 14 (4), p. 297-313. W. W. Tarn (1940). "Two Notes on Seleucid History: 1. Seleucus' 500 Elephants, 2. Tarmita", The Journal of Hellenic Studies 60, p. 84-94. Partha Sarathi Bose (2003). Alexander the Great's Art of Strategy. Gotham Books. ISBN 1592400531.
 and  for Ranajit Pal's alternative views on much of the history regarding Chandragupta and other key people and events in Indian history.